This year my 4th grader is using Right Start Level E. It’s hard to believe that she’s progressed from a child who struggled mightily in math to one who breezes through most concepts very easily. I’ve blogged about our favorite math program many times and I’m happy to say that even after multiple levels of the program we still love it. Right Start has been a huge blessing to our family. I’m thrilled with how well Curly understands math concepts. And I’m not embarrassed to admit that I’ve learned so very much through teaching the program. I no longer fear teaching math to my kids (well, except for the high school math part). Right Start E is the last book in the First Edition series before the geometric thinking level. After the geometric level, a student is prepared for Pre-Algebra! This level covers topics of fractions, decimals, percents, area, perimeter, division, square roots, primer numbers, factoring, averages, probability, angles, graphs, and geometric shapes. Every 7-10 lessons contains a review page for practice. There are also multiplication and division fact practice pages included. How is this level different than previous levels? Every lesson begins with a puzzle type problem as a warm up. In the beginning of the book the problems are a list of numbers such as: 1, 2, 3, and 4. The child has to use symbols and create equations that make sense with those numbers. Some sample answers are: 12 = 3 x 4 OR 1 – 2 = 3 – 4 OR -1 + 2 = -3 + 4. Later problems look like this: 2d + d = 9 and the child must determine that d = 3. Fewer hands-on manipulatives are used in this level. For this level the abacus is still used in some lessons as well as the calculator. However, the majority of the manipulatives used are drawing tools like rulers and triangles. Many lessons can be completed with just a whiteboard to use as a teaching tool. The lessons are surprisingly short and designed for the student to work on the practice pages independently. I’m finding that the lessons usually take less than 30 minutes to teach and can take as little as 10 minutes. What do we like about this level? I’m enjoying the shorter teaching time with these lessons. I glance up at the clock and realize that I’ve only spent 10 minutes outlining a new concept to Curly before she is ready to work on the worksheet pages on her own. Most of the worksheets are designed for the child to complete independently after a short teaching time. Curly is beginning to take more ownership of her math education and is able to work on her own for much of our math time. This is setting the stage for increased independence in math as she gets older. The first few lessons of the book review topics of addition, subtraction, multiplication, and simple fractions. Also, there are multiple review lessons throughout the book. These have been wonderful in helping me assess Curly’s understanding of the lessons. Seeing how well she does on these reviews gives me the confidence to keep her moving forward. One of the first topics in the book is fractions. These are taught in conjunction with rulers and measuring and then with money. Once fractions are taught using money, percents are introduced. Then both fractions and percents are taught using shapes and pie charts. Decimals are introduced later, using measuring, number lines, and money concepts. Then division is taught. I have particularly enjoyed how concepts are taught in conjunction with similar topics. The lessons seem to flow seamlessly into the next and now that we are more than halfway through the book I can see the wisdom in the order concepts are introduced. By the time we reached the division section, Curly was so comfortable with fractions, percents, and decimals, that she was able to see how division and fractions were related and she can easily convert numbers into any format – decimal, fraction, or percent. Through the various lessons we have learned how the stock market lists numbers and how to calculate the cost of gas with the percentages that are used. The lessons also teach how to figure sales tax. Seeing how fractions, percents, decimals, and division are frequently used in real-life situations has helped Curly understand why she needs to learn these concepts. She is learning how to apply concepts rather than just memorize formulas and methods. Curly has not been a huge fan of the puzzle style problems at the beginning of each lesson. However, I have seen how they have stretched her to play with the numbers and look for multiple solutions. My little rule-follower child can now look at a problem from multiple angles and see different solutions or find several ways to solve the same problem. Algebra and geometry concepts are woven throughout many lessons. Later in the book, most of the puzzle style problems are simple algebra equations. Area and perimeter of various shapes is introduced and taught in conjunction with other concepts of decimals and fractions. I can see how this introduction to both algebra and geometry will make our later studies easier. For us, this level has been very painless. The concepts are taught incrementally and build on previous topics. A solid foundation has been laid and we are just continuing to build. Jumping into this next level of Right Start from Level D has been seamless and…I’m almost scared to say it…easy. So, for those of you using lower levels of Right Start math and wondering if you can continue because of the teacher-intensiveness of the lessons, know that it does get easier. We are almost on the other side of our Right Start math experience and I can definitely say this journey has been so very worth it for our family. I’m reaping the rewards with shorter and more independent lessons, a mom who is confident in teaching math, and a child who has a rock-solid math foundation and quickly grasps new math concepts. Right Start is still my very favorite math program! Lexi. Thank you so much for this review. 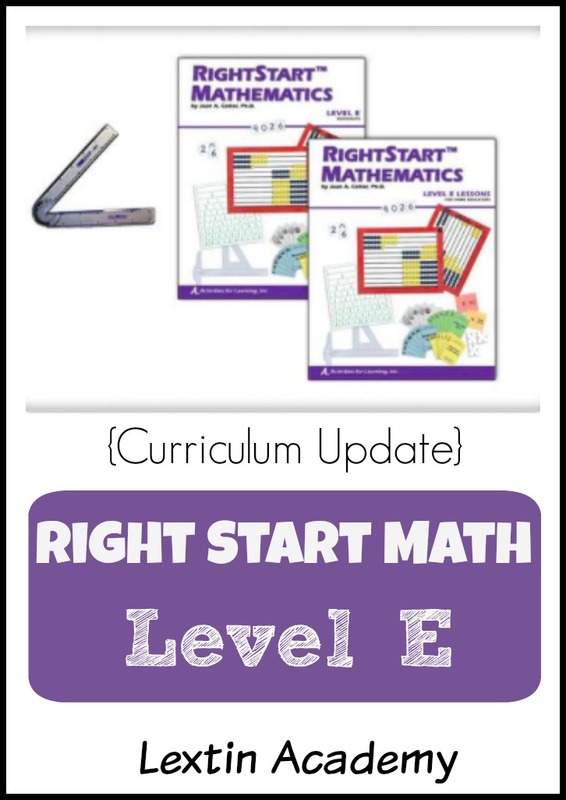 After meeting you at last year's Arc conference, and your recommendations for right start math, we have forged ahead with level C. And I must say, now that we're about halfway through we are so happy with this program. Thank you so much for your recommendation. You're welcome! I'm so glad it's working for you. We are so thankful we found Right Start because it has been a perfect fit for my kids. I'm happy with their math progress – and I'm learning a lot too! Thank you so much for this review! Our plan all along has been to switch from RS to Saxon 5/4 at the 4th grade level (so that my son can work independently, and because we have my husband’s Saxon books from when he was homeschooled). I’m just so torn. I’ve finally settled in and started to really LOVE Right Start, now that I’m slowing down our pace and seeing the value of it–and now that my oldest is in Level D and my youngest is finishing up B. You said these lessons in Level E took between 10-30 minutes to teach before independent work. Just for comparison, how long was it taking you to teach lessons in Level D? Level D took about 15-20 minutes, sometimes more. I found that with each level the teaching time decreases while the amount of independent work increases.